Alders voting in favor of Option #2 (buffered bike lanes): Bidar-Sielaff, Demarb, Eskrich, Hall, Kemble, Martin, Palm, Phair, Skidmore, Wood, and Zellers. Alders voting against Option #2: Ahrens, Cheeks, Clear, King, Rummel, Verveer. Carter was excused, Baldeh was chairing, and Harrington-McKinney abstained. Please consider sending a quick email to your alder to thank them for or let them know your opinion on their vote. Also at the Common Council was the Madison Yards project. This is a huge development project on the city's west side, next to the Department of Transportation building on Sheboygan Ave. If you followed the news coverage and Facebook discussion after the council meeting, there was some confusion about an amendment that seemingly affected plans for bike lanes on Segoe. The amendment was voted down and bike lanes on Segoe (and other affected streets) remain part of the project. At the Board of Public Works, the East Mifflin diverter passed unanimously. 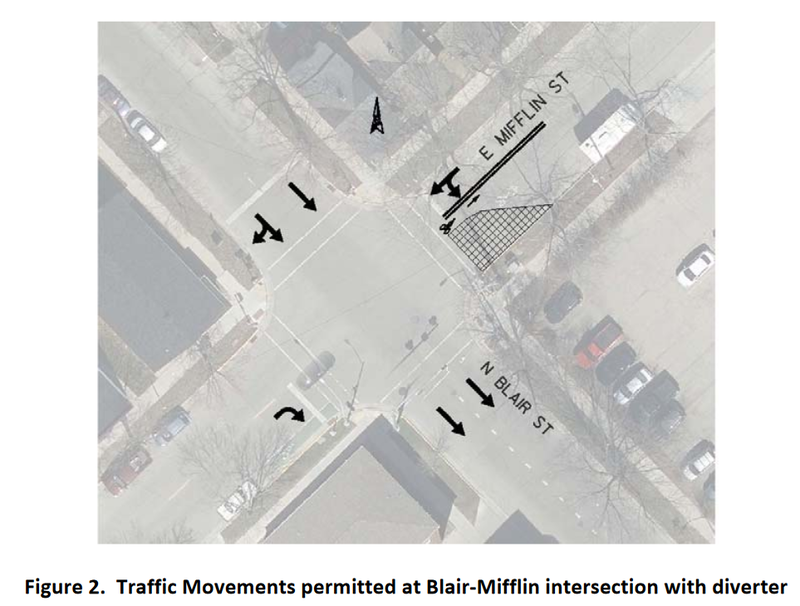 The diverter blocks motor vehicles from entering Mifflin at Blair and should help to keep traffic volumes on the bike boulevard in check. The city's report on the test installation of the diverter was positive, but public testimony at the meeting had a large number of critical voices. The project will now go to the Common Council. Places for Bikes released their new city rating system on Wednesday. The scoring system incorporates a variety of data sources on ridership, infrastructure, community perceptions, safety, and current investment levels. Madison scored 3.3 out of 5 possible points. This puts us on 6th place overall, and 3rd among large cities. Where we did worst was in the "acceleration" category, which rates "how quickly a community is improving its biking infrastructure and how successful its encouragement programs are at getting people to ride." 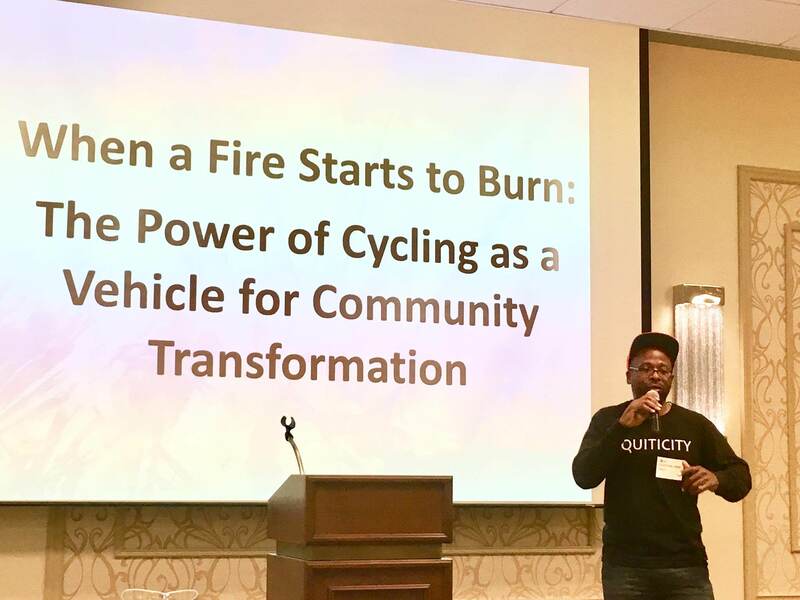 On the weekend, the Wisconsin Bike Summit took place, including the Madtown Unity Ride on Friday evening, "celebrating the unity and diversity of Madison and to connect communities together." Channel 3000 has a short segment on the ride. Tonight, on Monday, the Madison Bikes events committee has their monthly meeting. The next big event on the horizon is Ride the Drive and Bike Week in early June. 6pm at Barriques on Park. New faces are always welcome! If you want to see better biking and walking in Monona, attend the ped/bike open house on Tuesday. The city's bike and ped ad hoc committee will give a presentation on the committee's goals and an open house to discuss potential improvements. 6pm at Winnequah Elementary School. On Saturday you need to choose between two bike events: REI is hosting their Big Backyard Bike Bash. Dreambikes will accept donations of bikes and used parts at the event, and you can get free safety checks and use the bike was station. 10-4 at REI on the west side. If you'd rather combine biking and Craft Beer Week, join the 80s-themed Madison Bike & Brew Tour. All proceeds from the event go to Down with Bikes, Madison's newest mobile bicycle repair non-profit. 11am at Alt Brew.